We should notice that this verse begins with the two words: “so then,” indicating that this is a conclusionary statement regarding what was previously stated, wherein the subject matter is salvation. This is one of those defining Scriptures which we often use when leading a person to accepting the Lord Jesus as their Savior wherein they become saved according to God’s grace within the exercise of their faith. 1) Verbally stating that Jesus is one’s Lord and Savior; God. The word used here for “Lord,” Greek: kúrios, masc. noun from kúros (n.f. ), might, power,” “Master,” “Owner,” God.” “Kuros (supremacy); supreme in authority, Lord, master, owner.” Also it is the NT Greek equivalent for the OT Hebrew word: “Jehovah.” Also used concerning deity, as in God, depended upon the text, such as this verse which is without the article, Kúrios Iēsoús; Christós Kúrios, meaning the Messiah of God, deliverer of mankind, Savior of the world – GOD. (See Endnote #A). 2) A Heart Held Belief and Conviction in the Resurrection of Jesus Christ. In this threefold summation of the gospel of Jesus Christ what we see is that the first mandate, wherein Christ died for our sins is established according to the Scripture, and that the final mandate that he rose the third day, again is I established according to the Scripture. This same Paul, who in the book of Romans defines salvation regarding a public lifelong confession that Jesus Christ is a person’s Lord, Savior, and God; also including Jesus’ Resurrection (Which is God’s stamp of authority in Christ, by doing something humanly impossible, resurrecting s dead person from the dead), wherein Paul also contends that this gospel is according to the Scripture and cannot be separated from the word of God. You cannot separate a belief in all that Jesus did and said, From the rest of the New Testament, which is how radically done by those who claim the heading of Jesus only Christians. They violate the mandate of the gospel of Jesus Christ by refusing to adhere to all of God’s word as found in the complete New Testament, as well as the Old Testament which Christ validated repeatedly by citing. Yet upon this foundation faith must grow, but where does it come from? Does it primarily come from our experience – NO! Does it come from the doctrines and creeds of organized Christianity – NO! Does faith come from our parents and their belief system, and adherence to a denomination – NO! 3) There are scientific and natural insights presented in the Bible, which were once considered completely false; in time, science has caught up with the Bible proving that it was correct in the first place, and that it is beyond human insight. 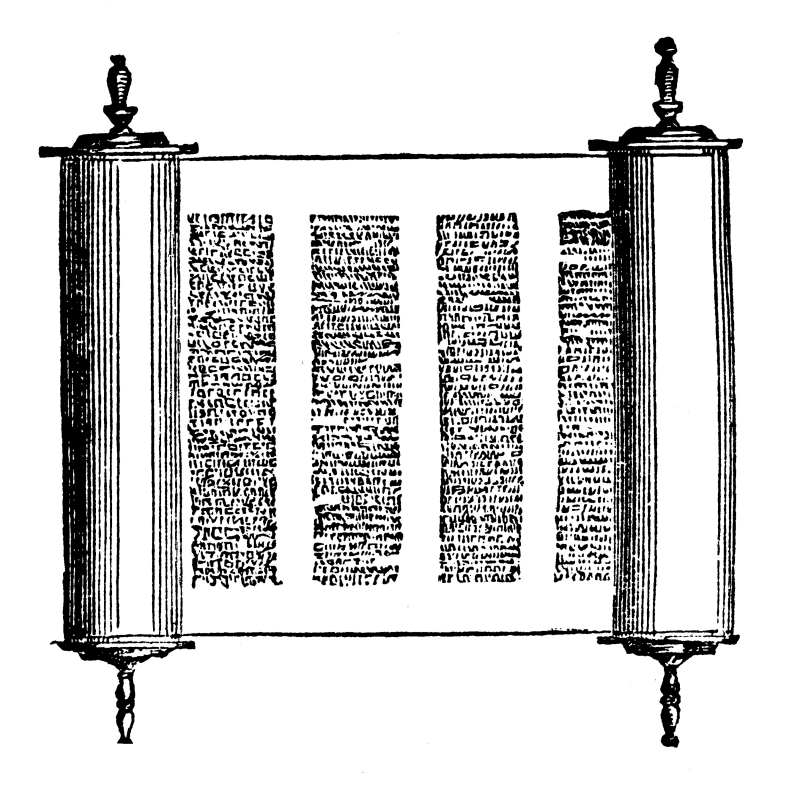 5) There are internal evidences found in the Bible when it is crossed-referenced within itself in such a way that it is obvious that 40 different men could not have utilized the exact same type of “Figures of Speech,” including: typology, such as seen in metaphor, similes, models; along with prophetic symbols as seen in even the use of numbers, colors, events, material and substances, dates, mathematics, names, roles, and even people’s personality and lives; all done to portray a shadow of things to come rather in heaven, or in the particular case of Jesus, the fulfillment of the Messiah; as witnessed in His First and Second coming – as well as Last Days events – all done in such a way that the only explanation is that God orchestrated the creation of this Book. All leading to the conclusion that this book was not written by man, but by a God that is outside of our time domain, who can see the ending from the beginning (Isaiah 46:9-10); who is all-powerful, and in total control of His creation (Isaiah 45:5-7), and therefore worthy of our complete trust and faith in what He has said and what He will do (Isaiah 46; Jeremiah 29:11). Biblical faith is one of those subjects that every Christian knows something about, yet many are limited regarding fully understanding what biblical faith is, and how it is meant to function not only at the time of their salvation, but most importantly; how it is to function in their lives on a daily basis. Faith is the only human commodity that pleases God (Hebrews 11:6). In fact one of the most consistent words regarding how God the Father viewed Jesus Christ is found in the fact that Jesus pleased God the Father in everything He did (Isaiah 42:1-4; Matthew 12:18; John 8:29; Mark 1:11; Luke 3:22; Matthew 3: 17; Mark 9:7; Luke 9:35; Matthew 17:5; 2 Peter 1: 17 ~ These are multiple references concerning the baptism of Jesus Christ, the Mount of Transfiguration, as well as The Isaiah prophecy of Jesus, and a record of his own words concerning Him only doing those things that please the father). The point is, in order for Christ to please the Father, Jesus had to exercise faith; and to do so on a daily basis. This may sound provocative, yet what it should do is create within the believer an intense desire to study this subject more deeply in order to understand how he too might walk daily in pleasing God the Father. Faith is always a behavior, an action, something displayed, something that is done; different than mere belief. 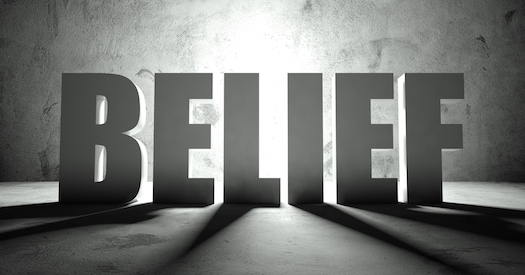 Belief is a cognitive function only, meaning that belief is a mental process that does not demand action, therefore it is only when an action is performed that the mental process of belief becomes the behavior of faith. One of the simplest and easiest illustrations of the difference between faith and belief can be seen in a person considering sitting down in a chair. 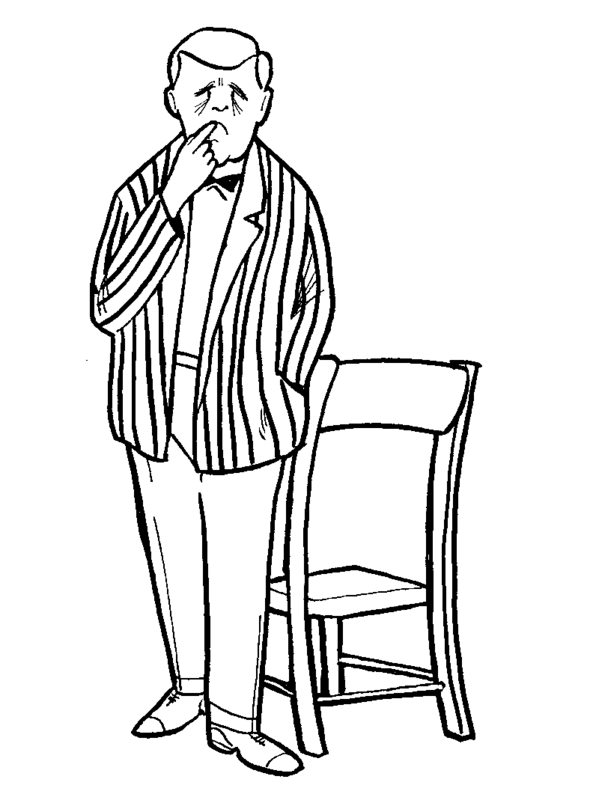 You could visually examine the chair noting that the legs appeared to be strong, with the joints apparently more than sufficient to hold your weight. You could walk around the chair noting any possible defects. You might even touch the chair and notice how stable it is. You could come to the belief that the chair could hold your weight. You could also come to the belief that you should sit in the chair, and that it would be safe. Yet all that you’ve done at this point is exercise the aspect of the mental assent – a belief. It is not until you physically sit in the chair, placing your body in a position of taking the chance that the belief is correct, that you exercise faith. If faith demands an action, and believe is only a mental process, how can the Bible use them interchangeably as synonyms of each other – why this apparent contradiction. In the English King James Bible, this apparent contradiction occurs mainly in the book of John, though also in the rest of the New Testament. 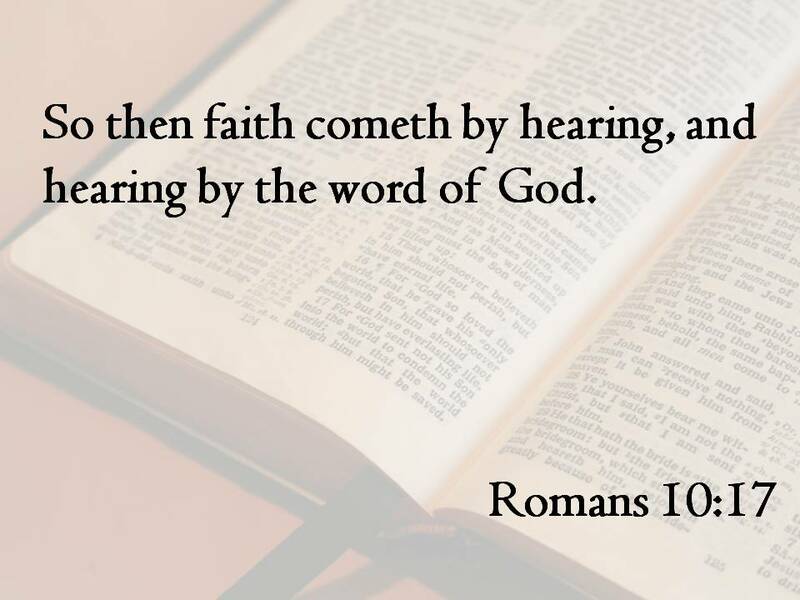 The reason why the word believe is utilized in the New Testament as the verb form of faith; is that in the late fifteenth century, just prior to the production of the KJB, there was a verb form of the word faith, known as faithe, (“Faitheth”) which fell out of usage in the English. And the authors of the King James Bible substituted the word “believe” to take the place of the verb form of faith that was no longer used, because at the time as the word “believe” and “faith” were almost synonymous. As stated, the English word“believe” changed in its meaning to depict a word which only describes a mental process and not a behavior, hence the current apparent contradiction; which is no contradiction at all in the Greek New Testament, only in the English translation which utilizes the word believe in a fashion that it no longer means what it once meant. Faith always starts with a belief, with the mental process; but then in order to become faith it must become strong enough to produce actions, due to what we refer to as a conviction. However, the word conviction is not strong enough to convey the relationship. A more appropriate word would be confidence, it is when belief becomes confident enough that the action of faith is produced; this is where biblical faith is seen. We will deal with this confidence in the later. The word translated into devils in this verse is actually the word demons. The belief that is referred to here is an acknowledgment of that which is perceived to exist does really exist, such as the fact that the demons believe that there is only one God, the God of the Bible. In fact they believed to the extent that they are fearful of Him. Yet the belief that the demons hold is not synonymous with placing faith in Him, which is seen in their behavior of having aligned himself with Lucifer; placing their trust in Lucifer and his abilities rather than God. 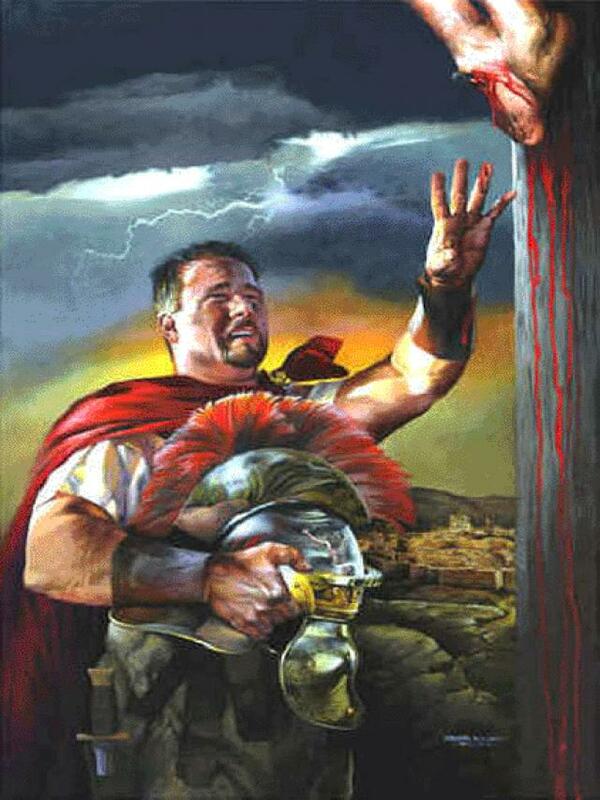 Without getting into the technicalities of the atonement, Jesus became a man to die for the sins of mankind. He did not become an Angel. We must remember that whereas mankind has not seen God and therefore exercises faith in a deity not seen by human eyes. The Angels have seen and experienced God and therefore if they choose not to trust in Him and His leadership, this form of disobedience is not forgivable. Yet even beyond this point, is the fact that salvation was not offered to them, it is only offered to man through the atonement of Jesus Christ who became a man to pay for the sins of mankind. Yet, also being mindful that the demons believed because they had seen, yet refused to continue to exercise faith, displayed disobedience in their lack of faith in God, further making the point that there is a complete difference between belief and faith. Therefore, faith unto salvation is more than belief in existence. 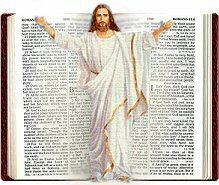 There are many that believe that Jesus existed, and some may even believe that He was a great prophet, while others even believe that He was the Son of God. Yet, this belief did not translate into faith wherein they believed what Jesus said to the extent that obedience was produced. We must realize that the action that faith produces is obedience. If we believe what God says, then we obey Him based upon believing in Him, wherein biblical salvation is exercised by following what He says that I must do to be saved. What we must remember is that when Christ spoke about “believing” unto salvation, in the original Greek the word was not the same word used today in the English for “believe” which is cognitive only, a mental process. 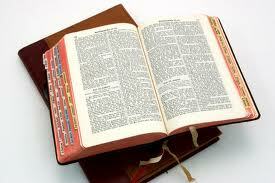 To reiterate, the Greek word was the verb form of faith which is different than belief. Faith starts with a belief, a mental thought; but then is taken to the next step of being confidence as found in Scripture (“Confidence” is due to an examination of God’s Word, which increases faith as seen in Romans 10:17; which we will get into in great detail below) which produces a change in behavior – an action. Normally, within the English language a verb is an action, and a noun is a thing. Yet within the Koine Greek language we must also understand that the noun form of “faith” can function as an action as well as a verb. Ache, Act, Answer, Attack, Back, Blame, Bomb, Bother, Break, Burn, Call, Care, Cause, Challenge, Change, Check, Charge, Comb, Copy, Damage, Dress, Full, Guess, Heat, Last, Laugh, Look, Mistake, Number, Park, Pay, Play, Practice, Promise, Reason, Rent, Reply, Rule, Saw, Season, Shop, Show, Smell, Study, Talk, Taste, Wish; but to name a few. And in the Koine Greek language, of the few occurrences where the word faith is utilized as a noun, and not representative of a behavior or action; there is a different type of application when the definite article “the”is used,such as a reference to the faith, concerning the system of Christian theology – a doctrine, or the Christian movement as a religious movement. People might ask if you kept the faith, after a time of the persecution, referring to the doctrine of Christianity. Or someone might refer to those that left the faith, in reference to those that have left the religious Christian movement, as in a religious organization. 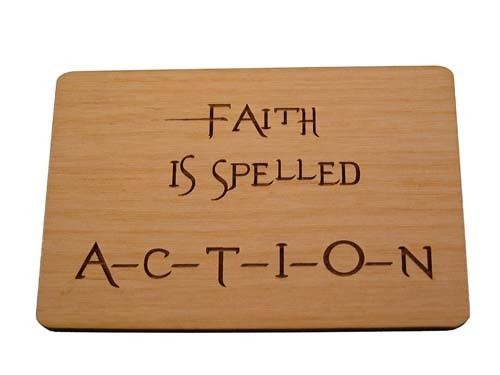 The reason why faith is always is action is because in Koine Greek language, were the article is NOT present, rather the verb form of faith, or the noun form of faith is utilized; almost exclusively it refers to an action or behavior, because it is always indicative of movement. Faith either moves towards the object that it places its trust in; or away from it (Such as seen in the Greek word: “apisits“ ~ in Greek, an “a” in front of a word means the word is the opposite of its normal use – apisits means non-faith, becoming more non-faith, becoming less and less – and is also an action as exhibited in a behavior. Such as, the fear of the disciples when the storm arose as they were crossing the lake. ), yet it is never stagnant. 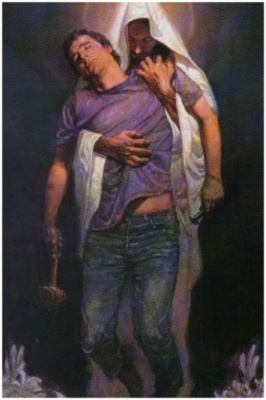 According to “The Law of First Mention,” the Hebrew etymology of the word faith it was first used in symbolizing a man leaning on a staff (Which can even be seen in the form of an allusion upon as found in Hebrews 11:21), placing all of his weight on the staff during a time of need, due to sickness or weakness. It was also used concerning baby chicks running to the protection of the mother hen during a time of trouble, such as during a storm. It is also in comparing all of the diverse passages which utilize the word faith that greater understanding is achieved in understanding all the shades of nuance which represent this word, perhaps the most important word in the life of a believer. If a concordance is utilized to look up all the different occurrences and applications concerning the word faith, the above concepts are further validated and greater understanding is gained. 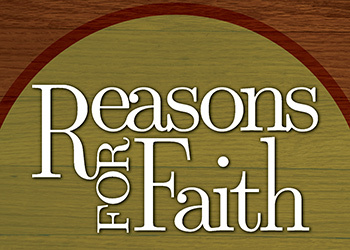 Faith is primarily indicative of a relationship, a relationship of trust. Many times believers attempt to use faith in gaining individual desires, referred to as prayer request (connotatively), yet more often than not, biblical faith is more specifically seated in relationships (denotatively). Faith can never be separated from the object (A person) of which trust is placed, due to its nature which mandates the development of a relationship. This is why faith, or to use a word more appropriate to our current vernacular, the word trust; is the most important element of any relationship. For example, within a marriage, there are times that the feeling of love or even liking a mate are missing, there are times that affection and fondness are absent, there are times when communication is nonexistent; yet these can all be re-energized or repaired. However, when trust is violated, the relationship suffers in ways that are more long-lasting than most other violations. The most extreme example in a marriage is when sexual infidelity (Latin, meaning a break in trust) takes place (All things are possible in God [Luke 1:37], and relationships can recover), there are very few that survive. This is why God in the Old Testament commonly refers to the betrayal of Israel by their idolatry as adultery, and whoredom; because the betrayal of violating faith is this severe. Faith mandates the ability to think and process information. Faith is never blind, faith is based upon reasoning and intellect, and that reasoning and intellect is founded in God’s Word. Faith is achieved when God’s Word is read and understood, and makes sense and is logical (This is not logical in the normal sense, such as following the Laws of Nature, which God commonly defies. This is logical in the sense that it is systematic, and not contaminated by chaos; contradictory or confusing) and is therefore believed. Many unbelievers within the field of modern science state that faith is superstitious, or based upon feelings; this displays their lack of understanding of biblical faith as found in the God’s Word. Yet, unfortunately, because so many people misunderstand faith and abuse what they call faith, they foster this misrepresentation of biblical faith. Faith is always logical, systematic and sequential regarding what the Bible says; and presents conclusions that what God has said is true, and that He is to be trusted. God is rational, not superstitious. For example, we read the story of the Exodus from Egypt, and we learn that of the 10 plagues upon Egypt, and through in-depth biblical study it is determined that each plague was directly related as an assault upon a false god of the Egyptians. God is a logical God, yet His logic is so much above ours, that if we try to define Him according to what we call logic, we get into trouble. God’s logic is trusting in Him, in what He has said in His Word, God’s logic is based upon God’s Will. This is not the same as human logic which is based upon our perception of rationality, when we as fallen creatures have no ability to connect with God’s logic. Whereas, belief is a cognitive function, confidence is the accumulated beliefs according to the repetition that the source is deemed credible and trustworthy. When someone or something habitually does the same thing, then confidence is the outcome. In years past this was called a conviction. Confidence must be based upon God and His Word, which includes the history of what He has done, a portrayal of Who He is, and what He has to say; all based upon His Word. Confidence is gained because we see God’s ingenious interweaving within His Word, where time after time He reveals Himself, sometimes hidden, sometimes not; yet always consistent in who He is, and how He behaves. We must realize that faith without God’s Word; is faith without confidence. 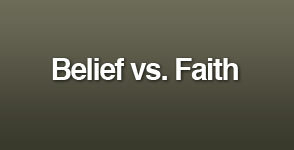 And actions based upon faith without confidence is superstition, and not biblical faith. This is why the Bible very plainly tells us what is to be our source concerning faith; it is God’s Word; as opposed to the human assumption that experience alone is the basis of faith. Experience is the basis of faith, but experience based upon God’s Word, and not human experience as related to the outside world. Faith is to be based upon what God has said in His Word, as opposed to solely our own experience, which many times can simply be superstition. It is when our experience lines up with what God has said in His Word that our experiential experience builds faith. It is when what God has said something in His Word that seems to contradict the circumstances that we find ourselves in our lives, and we choose to trust God, rather than the human logic of the circumstance; this is when we follow faith rather than our own logical sight. Those that abuse faith by using this passage to state that it is God’s Will that believers be in good health, insisting upon physical healing; display a reckless abandoned that even the English grammar defies. First, this is a pastor writing a personal letter to a personal friend, Gaius (3 John 1:1); using personal pronouns to an individual, indicating it is his wish, his desire (“I wish”); literally in the Greek it is his prayer to God, that this friend who had went through many trials and tribulations might at last prosper and be in good health; even as Gaius, who had been through terrible tribulation had prospered spiritually having trusted God in spite of the circumstance. This is not a statement from God, it is a desire presented to God whereof the passive request is seen in the use of the word “mayest,” even though the verbs are active, and a reality. The verbs in this verse are a reflection of the author’s desire, not a declaration concerning what is desired becoming a reality. John would never display the type of arrogance to presume to make a judgment or declaration in the place of God, declaring that someone would become prosperous – John never displays this type of arrogance or presumption anywhere in his writings. The historical record is set concerning this individual and the conditions surrounding this letter to him. This actually makes the reverse case concerning the assumption of healing wherein this passage is distorted. For those that would take passages like this out of context, isolating them from prior passages, as well as later passages concerning their exact meaning in context, one has to only turn to 1 John 5:14, for a simple rebuttal to this heresy. This passage plainly states that we have confidence that God will hear us concerning our petitions if it is according to His Will – this is the end of the subject – period – you cannot state that using passages such as 3 John 1:2, that it is God’s will that we all be healed, prosper and be in good health. God will not be manipulated according to His Word to do man’s will, that’s not what biblical faith is all about. Faith is not about getting what we asked for; faith is about trusting that God is in control of what we get. Faith is found in God’s Word because of the consistency of witnessing miracle after miracle exhibited in God’s word, with the end result being that truly this book could not have been authored by man, but must have been offered by He who can see the ending from the beginning – God Himself, wherein this book deserves our greatest attention as God’s revelation to man. 5) Wherein internal evidence is found in the Bible when it is crossed-referenced within it’s self in such a way that it is obvious that 40 different men could not have utilized the exact same type of Figures of Speech, including: typology, as seen in metaphor, similes, models; along with prophetic symbols as seen in even the use of numbers, colors, events, material and substances, dates, mathematics, names, roles, and even people’s personality and lives; all done to portray a shadow of things to come rather in heaven, or in the particular case of Jesus, the fulfillment of the Messiah; as witnessed in His First and Second coming, as well as Last Days events. 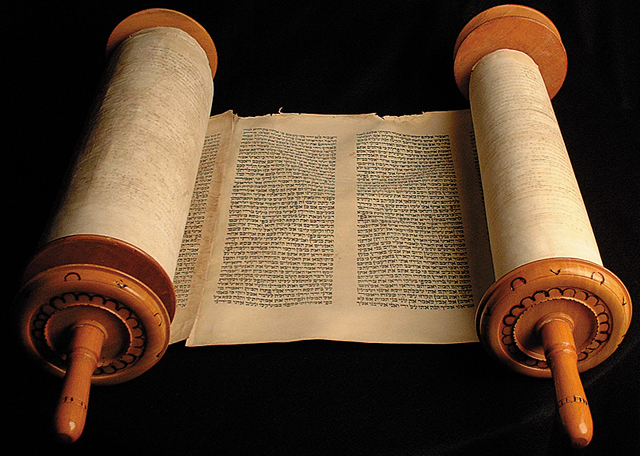 All of this leading to the conclusion that this book was not written by man, but by a God that is outside of our time domain, who can see the ending from the beginning; who is all-powerful, and in total control of His creation, and therefore worthy of our complete trust and faith in what he is said and what he will do. As we read through Scripture we see a repetition, that even though there are 40 different authors (Scribes), from all different types of occupations, backgrounds, and locations; writing over hundreds of years (Over 1600); there is a consistency that is remarkable, and beyond the capability of human design. A consistency concerning who God is and the way God deals with men; He can be trusted. Confidence is the normal fruit that is born when what is experienced is deemed to be truth, and the truth of God’s Word is what the believer is to unearth as he reads page after page of the Bible. There are over 333 different titles given to the Messiah which present a description that is beyond human ability to fulfill. These prophecies, written hundreds, if not thousands of years before the birth of Jesus Christ, are so specific that God handicaps Himself, rather than giving vague prophecies that could give God wiggle room. God will not be held accountable to any man, but He constantly puts Himself in a position where based upon the details He presents, it is far beyond coincidence or contrivance that He fulfills what He said. The statistical probability of Jesus fulfilling just 8 of those prophecies is 1:1028. This number is so large that it is hard to comprehend. 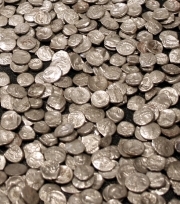 The old example of how large this number is can be found if you take enough silver dollars to fill up the state of Texas two feet high; then take one silver dollar and paint one side of it red, facing down and place it anywhere you desired within the state. Then gave another person a helicopter and told them to go anywhere in the state and drop-down one time and pick up only one coin, that they would pick up the coin that was painted red on one side – the possibility of them doing this on the first try is how large this number is. This is the probability that a single person could fulfill only 8 of over 300 prophecies, given over hundreds of years specifically made concerning the Messiah. We are not to merely read God’s Word, we are to study it; to examine it; and therein will we gain faith according to God’s Word. Confidence is built according to a track record, a track record that the believer achieves which produces confidence in God, is God’s Word, the Bible. Biblical faith is never superstitious, which is based upon emotions. The Bible repeatedly states the necessity to use the mind and approaching God. God never instructs man to be led by his emotions. God expects man to approach Him using his intelligence, not in spite of it. It is in processing information that we come to faith, it is by thinking upon God’s Word and approaching it rationally that faith grows. God is not haphazard or illogical, yet there are times that He expects man to follow Him in spite of man’s own relevant logic. The point is, God has given us a rational mind to follow a rational God, yet this same God at times works outside or beyond human rationality. If we follow God long enough, we will see that a track record of trust is built because of the consistency and trustworthiness of God and where He leads, and what He has said in His Word. The world says “seeing is believing,” where the Bible says, “believe, that you shall see” (John 3:3;11:40), yet this faith is always built upon what is said in God’s Word, which is according to God’s track record, and not a blind reckless emotional presumption. It is impossible to separate action from faith, it is impossible to separate confidence from faith, because faith is based upon these prerequisites. From the observation of the world we see a man’s action, which betrays a belief system that determines His worldview, and therefore we define the essence of that man’s heart. This is what faith is, it is when a person believes something so much that it changes the course of their life (This is the definition of the word “repentance,” that of changing a person’s mind, wherein their actions are changed, where the direction of their life goes in the opposite direction of humanity. Repentance is turning from our way to God’s way, which is a synonym for faith), this is what faith is. The Complete Word Study Dictionary, General Editor: Spiros Zodhiates, Th.D. ; 1992 By AMG International, Inc.
Strong’s with Tense, Voice, and Mood, Dictionaries of Hebrew and Greek Words taken from Strong’s Exhaustive Concordance by James Strong, S.T.D., LL.D., 1890. 1. Holman Bible Dictionary, Holman Bible publishers, Nashville Tennessee, 1991, page 469. It is in understanding how God feels concerning His glory, and therefore His hatred of idolatry; which enlightens us concerning these particular 10 plagues that He brought upon the Egyptians (Exodus 7:20-12:30). Because behind each one of these plagues is a direct assault against the Egyptian deities that they worship instead of God. It is with an almost sarcastic distain, which God inflicts upon them torments which directly connect with their idol worship. God not only displays his power and majesty in the miracles, but he does so in such a way to communicate directly to them concerning their evil. The Egyptian had gods for many animals and things; therefore God sends plagues against these same gods, displaying his contempt for them, as well as their impotence and vanity. God specifically attacks the things they worship. God is jealous concerning His glory, and whatever man worships in the place of God, God will use to bring them down. We must remember that worship is only showing the worth of something, it is where your priority lies; it is what has great value to you. You do not have to bow down to a golden Idol, to commit idolatry; all that you need to do is play something in the stead of God and hold that in such great value, where God and God alone was meant he placed. God many times conducts himself in what we would consider either sarcastically, or in irony. If God does not use a man’s idol to bring him down, He may choose to make him like his idol. A Man that worships money is superficial, materialistic, and inconsistent. The man that worships power is overbearing, controlling, self-consumed, and insensitive. However, if a man worships Jesus Christ; he will become more giving, more loving, more concerned with others, and seek to do God’s will more and more. It’s your choice. The following was provided by KOINONIA HOUSE, khouse.org. The first of the judgments was upon the waters of Egypt. The Nile was the highway of this ancient land, as it still is today. Not only was the Nile turned to blood, but the other waters of the land were as well, even the water that was drawn for use in the houses in wooden and stone jars. For seven days the whole land was in horror, with dead fish and a stench from the river. To better appreciate what was going on, we must examine the numerous gods of the river: Osiris, one of the chief gods of Egypt, was first of all the gods of the Nile. He, with his companion, the mother god, Isis, and their child, Horus, were human-headed gods (in contrast to the many that had heads of birds, beasts, and reptiles). There were other gods of the Nile, too: Hapimon in the north, and Tauret at Thebes, and the hippopotamus goddess of the river. There was also Nu, the god of life in the Nile. The supernatural pollution of the waters of the land were a humiliation to the gods the Egyptians worshiped. The third of the judgments on Egypt came out of the soil in Egypt. The Hebrew word ken, is translated “lice” in our English translation, with “sand flies” or “fleas” in some marginal notes. The Hebrew word comes from a root meaning to dig; it is probable that the insect was one which digs under the skin of men. This was an embarrassment to their great god of the earth, Geb, to whom they gave offerings for the bounty of the soil. Also the presence of the fleas or lice were a barrier to their officiating in their priestly duties! 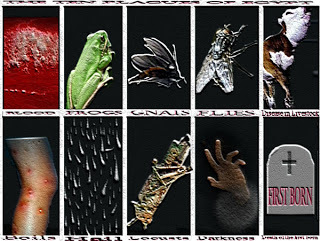 The fourth of the plagues were “swarms” (“of flies” is not in the original). The word is `arob, a swarm, possibly suggesting incessant motion. The deification of the scarab beetle is still conspicuous – even today – in the jewelry and artifacts celebrating ancient Egypt. Amon-Ra, the king of the gods, had the head of a beetle. Some of the giant scarabs were even accorded the honor of mummification and entombment with the Pharaohs. This is particularly bizarre since the scarab is actually a dung beetle. The insect is about the size of a nickel and feeds on dung in the fields or the side of the road. When animals defecate, these insects swarm from their holes in the ground and collect their provender for future meals by forming it into round balls about the size of golf balls, which they roll across the ground to their underground dwellings. Since they seemed to “come from nowhere,” and perhaps because these perfectly round balls were possibly associated with the sun, these beetles became associated with creation. The plague of swarms of scarabs, with mandibles that could saw through wood, and destructive qualities worse than termites, must have caused extreme consternation since they were so venerated and thus were not to be interfered with! Pharaoh called Moses, pleaded for a cessation, hinted at the possibility of compromise, and even asked to be prayed for. But God doesn’t compromise; the judgments continued. The fifth plague was against the domestic animals of Egypt, and thus Apis, the bull god, and the cow-headed Hathor, goddess of the deserts. These were so widespread that even the children of Israel had become tainted by their worship, which led to the fiasco of the golden calf in the image of Apis. The plague was a “murrain,” a contagious disease among the cattle, and even the sacred bulls in the temple died. Other domestic animals were sacred also, and their images adorned many of the idols, such as Bubastis, the cat goddess of love, feminine matters and fashion, etc. (The veneration of cows still creates a sight in India, when cows appear on the streets and even in stores and shops.) The cattle of the Hebrews, of course, were not touched. The sixth wonder was manifested against the bodies of men. The plague of shechiyn, translated “boils”, may hide something more terrible. The root means “burning,” and the same word can be translated as leprosy, and as the Egyptian botch, which was declared to be incurable. Among the gods to which cures would have been ascribed were Thoth, the ibis-headed god of intelligence and medical learning, and Apis, Serapis and Imhotep. Here even the magicians did not escape and could not carry on their priestly functions. It was their custom to take the ashes of human sacrifices and cast them into the air. Borne by the wind over the milling populace, they were viewed as a blessing. (It is inferred by some that this heathen custom was the source of the practice of putting ashes on the forehead on the first day of Lent.) 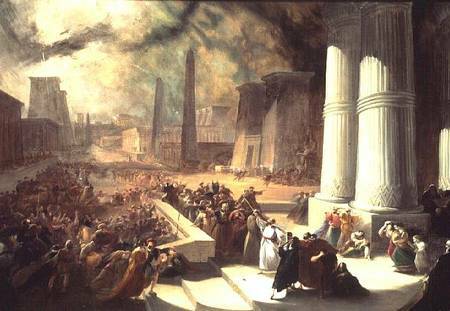 Moses launched this plague with a parody of this practice, and may even have had access to the very furnaces used in the sacred precincts of the royal temple. Some of the earlier plagues may have been separated by extended intervals, but the eighth plague followed immediately on the heels of the seventh: locusts came upon the land. Every twig and leaf that had somehow escaped the hail and fire was now taken by the locusts. Where was Nepri, the grain god? Where was Ermutet, goddess of childbirth and crops? Where was Anubis , the jackal-headed guardian of the fields? And where was Osiris, great head of their senior trinity who was also their agricultural god? Having lost faith in their gods, rebellion was now in the air. Where was Ra, god of the sun? In the school of On, or Heliopolis, city of the sun, the worship of Ra was virtually almost monotheistic. He and Aten, the sun’s disc, were worshiped with the ankh, symbol of life from the sun, as almost a sort of trinity. Where was Horus, the god of the sunrise? Or Tem, the god of the sunset? Or Shu , the god of light? Or the deities of the moon and planets? And, of course, the well-known tenth and final plague was the death of the firstborn – on those homes not covered by the lamb’s blood on the doorposts or lintels. This was God’s way of inflicting the most severe judgment of them all, that of taking human life. But we must understand according to the law of Primogeniture, the firstborn was the rightful heir of the family; therefore for God to kill a man’s firstborn was a way of destroying is lineage, as well as his destiny. Pharaohs destiny was destroyed. Thank you this is good spirit food .